Scottish Stained Glass designs, manufactures and installs stained glass in restaurants, hotels, bars, casinos, office and commercial buildings. We even designed some of the glass for Disney in Florida. Every piece is custom designed and will meet all building code regulations. 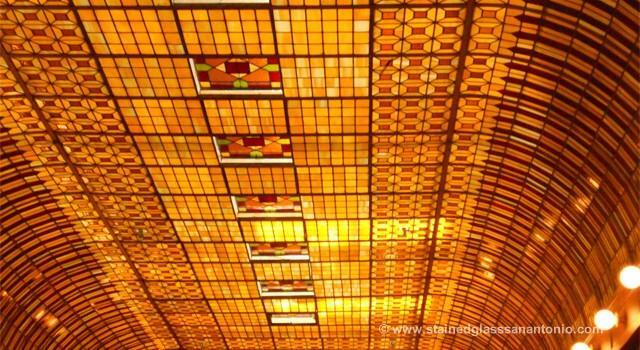 Architects can call us for free advice on the best methods for installing stained glass while they are at the planning stage and as always every stained glass panel or light fixture we design in San Antonio will come with free installation. Most restaurants will use some color in their stained glass light fixtures but often the front doors will be done in clear beveled glass. This allows patrons to see into the restaurant at night and gives a warm and inviting look from the outside. The importance of artwork and design features in commercial businesses such as restaurants and hotels can never be emphasized enough to the owners of these buildings. Their clients want to have a unique experience and when they leave have a desire to return. Stained glass will help with that overall experience. For example we were commissioned a few years ago to work on the stained glass ceiling at the Boulderado Hotel pictured on this page. This has become such a landmark that visitors come into the hotel just to look at the ceiling. We can`t tell how much revenue this has generated over the years for the Hotel owners but I`m sure the stained glass has been paid for many times over. Please call us to discuss your project and let us become partners in generating additional revenue through the inclusion of beautiful stained glass for your business in San Antonio.